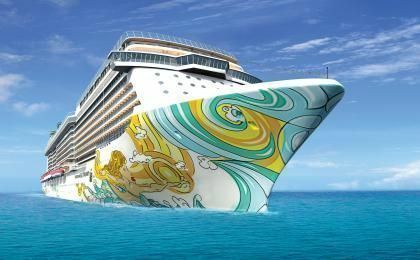 Norwegian Cruise Line may be leading the race among the majors to win the hearts and minds of novice cruisers. Just as their tag line “Cruise Like a Norwegian” brings to mind intrepid explorers, fierce Vikings, or freestyle cruising depending on your point of reference, innovation has become their signature. Vacation seekers who read about the Norwegian Breakaway that charmed New Yorkers will be delighted to learn that the Norwegian Getaway will be sailing from Miami, Florida to the Eastern Caribbean beginning February 2014. After New York City’s high energy attractions and entertainment successfully fueled the Breakaway, this younger sibling is taking her cues from the Latin culture of Miami and all the sun, fun and Spanglish charms of that city. The enormous white hull is being painted by noted Miami muralist David LEBO le Batard, whose work can be seen in the Wynwood Arts District. The Norwegian Breakaway’s most popular features, like The Waterfront — a quarter-mile-long outdoor promenade that brings cafes, gelato stands, people-watching and strolling to Deck 8 — will be prominent. Among the planned nightlife venues on Deck 8 are the Sunset Bar, taking its styles cues from Mallory Pier in Key West, and the Sugarcane Mojito Bar where Cuba Libres will surely have to follow mojitos on the cocktail menu. With a crowd that enjoys the Miami food scene, we know the rumored Brazilian churascarria and foodie chef Geoffrey Zakarian’s Raw Bar will be culinary hits among the 27 anticipated eateries. Another guaranteed crowd-pleaser is the ca. 1950’s Fontainebleau Hotel/Miami Beach glamour of the large dining and dancing ballroom named Tropicana. Early reports indicate there will be Latin dishes on the largely continental menu, and more Latin and Brazilian fare served in the Flamingo Bar & Grill. The ship’s center of activities will be 678 Ocean Place, an atrium that soars up through Decks 6, 7, and 8 to create a striking entry way to the fun. Families traveling with toddlers through teens will find extensive children’s club programming at Splash Academy, where counselors lead several age-appropriate day camps. At Aqua Park the fastest waterslide at sea dominates a corner of the pool level, but in this pirate-themed, waterplay area there is also plenty of wading room for little ones. The ship will offer exclusive Nickelodeon entertainment with favorite fuzzy characters on board for photo ops, and more play areas (wet and dry) themed to SpongeBob SquarePants and his crew. Some special events include Nickelodeon’s Pajama Jam and Dora’s DANCE Party, and some will require special entry tickets. Among the many scheduled activities, you can expect a circus school, cupcake-decorating classes and family fun challenges where your kids can take home a gold medal. Older kids and parents can use the main pools and four hot tubs to relax after working out, using the terrifying-sounding upper deck zip line, or taking what we hope will be Zumba classes at their state-of-the-art gym. A wide range of entertainment options (some for a premium but most included in the basic cruise cost for these Breakaway class ships) includes a new magic show and a dinner theatre, plus fireworks at sea. Just as Breakaway pioneered the idea of keeping cruisers in their seats for a full-length Broadway show, the Norwegian Getaway will have regular performances, at no extra fee, of “Legally Blonde.” What a great way to introduce kids to Broadway. All the cabin sizes are comfortable and well designed, but if you save up, you can look forward to The Haven two-bedroom family suite on a specially keyed deck (with concierge), whose scale, furnishings and balcony will spoil you for other ships. For more information and to learn about early booking discounts, follow the Norwegian Getaway website or call 888/445-7936.